About a month ago one of my sisters told me about this site with really fun, bright pictures. Did you ever find a new site that kept you paging through post after post until you realized a LOT of time had passed? Well that's what happened when I found Color Me Katie. This girl has one of the largest imaginations I have ever witnessed. She's an incredible photographer. She's also part of Improv Everywhere, pulling off random hilarious stunts like this or this. I'm not posting any pictures of hers here, because I don't want to infringe on any copyright issues, but pop on over to her site for some fun. It is seriously fascinating. For the Feature Friday part, I mimicked her rain drop picture....switching it up a bit for Rex. Here it is. Thanks for having such a fun blog, Katie. I love how you carry out all the random things that many of us only think about. You rock. All of you - see you tomorrow for Sharing Saturday. Thanks for stopping by. She really is awesome. I'm glad you have her a shout out. Your picture turned out pretty cool too. I love her stuff! Your picture came out really cute. Oh how ADORABLE this is! I just love her pictures and her unique decorating ideas. I've been following her blog for a little while now. I love your rain drops. your site is one that i just came across and had the same experience you were talking about here, where i lot about 3 hours one night looking thru every post on your blog. You are so stinkin creative! Thanks for sharing all your awesome ideas and finds on other blogs. This is such a cute picture! Did you just cut the raindrops out of paper and tape them to the wall? Sarah - Yup! 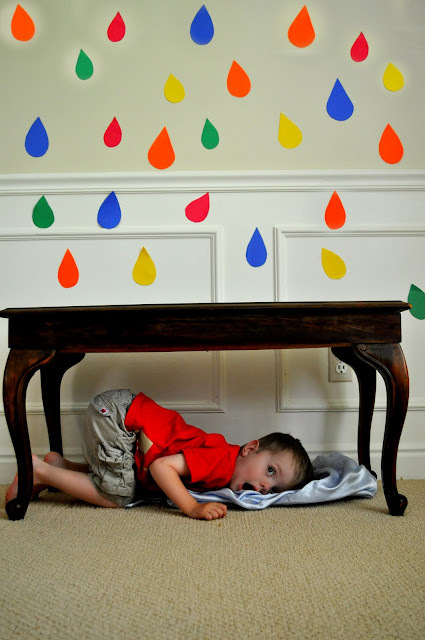 The raindrops are just cut out of construction paper and then taped on the wall. Fun, huh? How you feel about Katie is how I feel about you! I spent a whole day reading, really reading your whole blog. FUN. My visits to Color Me Katie always leave me feeling so inspired! Your site did that to me yesterday. I think I was on here for way too long. Her site is very cute also. Very creative.